Whiz 1 cup of mixed nuts in a blender until finely chopped (but not powder), add these to 1 cup of cooked millet, and 1 cup raisins and set aside. In the blender again place 1 large (or 2 small) ripe banana, 2 tbsp of peanut butter and 5 dates. Blend together into a gooey runny mixture. Add the wet mixture to the dry and mix thoroughly. Line a 9 x 9 inch baking tray with baking paper. Spread out your mixture evenly pressing with a spatula. Place in an oven pre-heated at gas mark 4 / 175 C / 350 F for 20-25 minutes until golden brown and smelling delicious. 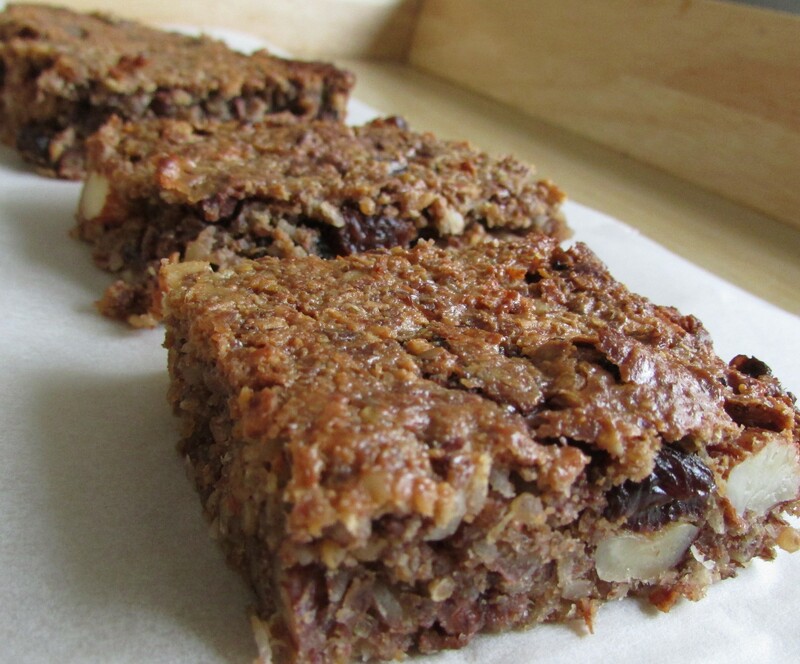 Allow to cool completely then cut into 12 squares and enjoy as a snack or as breakfast on the go. Healthy and scrumptious! This entry was posted in Bargain Bites, Budget Breakfasts on February 17, 2015 by carolinementzer.